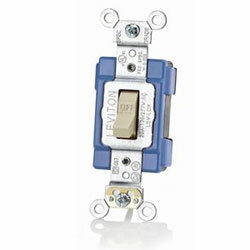 Lev-Lok 15 Amp 120/277 Volt Extra Heavy Duty Modular Industrial Grade Single-Pole AC Toggle Switches are part of the new line of Leviton devices engineered for fast and easy installation. Leviton's Industrial Grade AC toggle switches for extra heavy-duty applications represent top-of-the-line quality and peak performance. Leviton uses the finest materials available and the highest production standards to produce industrial switches of unmatched versatility and reliability.